Hellooooo!!!!! It is finally my favorite time of the year: AWARD SEASON! To start us off was yesterday’s Golden Globes, hosted by Ricky Gervais. Ricky…well..uh…let’s see…he was Ricky to say the least. I honestly do not understand why the HFPA asked him to come back for the fourth time to host the Globes because he was not necessarily that funny and was more cringe worthy if anything. That aside, the Globes yesterday were fantastic because of all the amazing winners! Make sure to check out TSL’s live twitter feed from yesterday’s show for more of my reactions and opinions about the show! Best Motion Picture Drama: The Revenant YES! I am so excited to see this movie, well deserved! Best Motion Picture Comedy or Musical: The Martian, I agree with the director Ridley Scott’s comment, was this really a comedy though? Best Actress in a Motion Picture Drama: Brie Larson for Room. Yup, predicted that but I honestly didn’t realize how young she was until I heard her voice in her speech. Best Actor in a Motion Picture Drama: Leonardo DiCaprio for The Revenant, YES YES YES YES YES! For those who know me, Leo is my all time favorite actor so this was a big moment for me. Best Actress in a Motion Picture Comedy or Musical: Jennifer Lawrence for Joy, yup predicted that, but the girl just has so many awards already. Best Supporting Actor in a Motion Picture: Sylvester Stallone for Creed, I honestly did not see that coming but it was so deserved! The standing ovation and Sly’s great speech were among the best moments of the night. Shoutout to Asha A and her favorite win! Best TV Series Drama: Mr. Robot, did not see that coming!! Best TV Series Comedy: Mozart in the Jungle, did not see that coming either! Best Actor in a TV Series Drama: Jon Hamm for Mad Men, yup predicted that. Best Actress in a TV Series Drama: Taraji P. Henson for Empire, I thought it was going to be Viola Davis but I love Taraji and Cookie so much!! Her speech was simply so Cookie and perfect! Best Actor in a TV Series Comedy: Gael G. Bernal for Mozart in the Jungle, did not see that coming..going to have to look more into this show! Best Actress in a TV Series Comedy: Rachel Bloom for Crazy Ex-Girlfriend, did not see that coming either! Wow these CW actresses (Bloom this year, Gina Rodriguez last year) are really sweeping these Globes. Best Actor, Limited Series or Motion Picture for TV: Oscar Isaac for Show Me a Hero, yup predicted that because I just love Oscar Isaac! Best Actress, Limited Series or Motion Picture for TV: Lady Gaga for American Horror Story: Hotel, uhh no did not see that coming and I don’t think anyone else did either because that room was just awkward when she won…Also Leo was not throwing shade at Gaga people, she just bumped into him accidentally and he was reacting to that! Chill! Okay so I do not really feel like typing out the rest so check out the full list of winners here. On to my other favorite part of award season: THE RED CARPET! This time around we have a very special guest Amanda A joining us with her Red Carpet picks as well so let’s see if any of ours overlap! My favorite! I love the cut of the dress and the shine, she looks like a Golden Globe. Simple and elegant, like a Greek Goddess. Love that color on her, matches her hair! 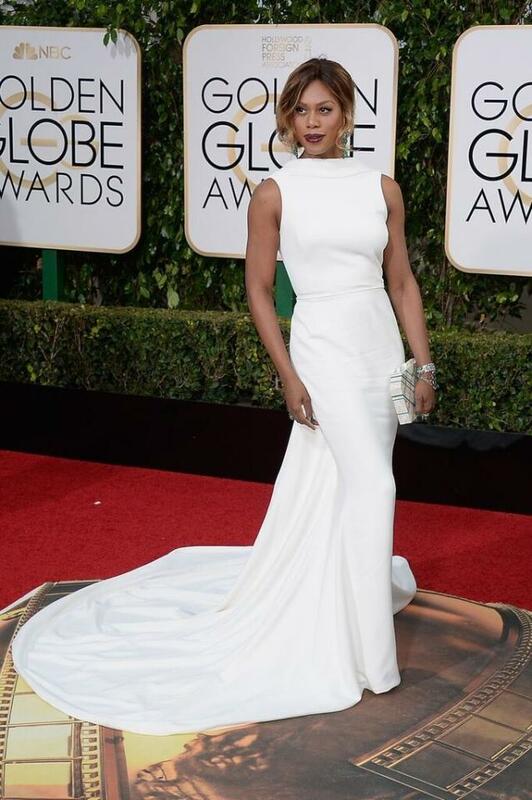 Another white dress that I loved, mainly because of the fierce lady rocking it! Okay I’m sorry, I know not everyone loved this look but I surprisingly like it for some reason. It just seems like something Kate Hudson would wear and you know, if I had a bod like hers, I would show it off too! Very classy! Even though I am still a bit surprised by her win, I do appreciate how much her style has evolved. More white! I love the flow of this dress though. The dress is horrid, the color is horrid, her hair is horrid. No honey, just no. This dress is horrid, the color is horrid, her hair is horrid. No honey, just no. Unique silhouette and a great color on her. Beautiful color on her and a great neckline. She looks like the night sky. Got to give it up for J.Lo. She looks classy for once. Her dress is a great color and the shape is unique and interesting. Simple yet sparkly…my favorite. Actually reminds me of my prom dress which was the same color as my hair too. Love Laverne and love the way this dress flows on her. So chic! That look is so classy! How dare Leo laugh at her for winning an award! She still looks kinda scary though. Props to her for designing her own dress. It’s flattering and I like its shine. It kinda looks like a trash bag though. Looks like a nightgown and her hair is too retro. What was she thinking? 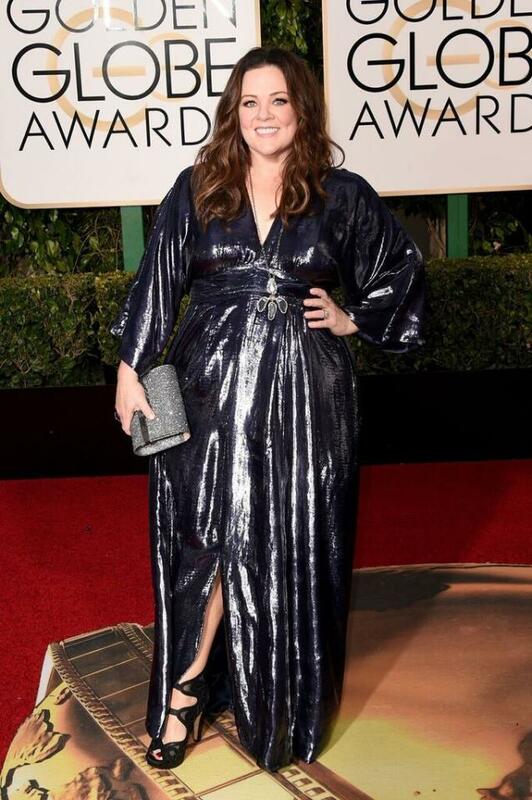 She is at the Golden Globes not the club! This dress looks like a tablecloth or a sofa covering. Sorry I just thought it wasn’t glam enough. Ok so that’s the end of our Golden Globes coverage! Special thanks to Amanda A for her red carpet picks and to Asha A for watching the show with me! We’ll be back for the SAG awards Saturday, January 30th.